Makes 4 servings with plenty of leftovers. 1. Make the pork shank. Preheat oven to 325 degrees F. Season your pork shanks with salt and pepper. In a heavy-bottomed pot (Dutch oven) on the stovetop over medium-high heat, add oil and let it get smoking hot so you can sear shanks to a dark golden brown, about 6 minutes per side. 2. Remove the shanks from the pot and place them on a plate. In the same pot, add carrot, onion, celery, bay leaves, thyme, and orange zest. Cook for 10 minutes, stirring occasionally until all the vegetables are tender. Reduce heat to medium, add tomato paste, and remaining salt and pepper. Cook for 10 minutes, stirring occasionally. 3. Add white wine, to deglaze pot. Cook for 1 minute and add chicken broth. Increase heat to high, bring to a boil and return pork shanks to the pot. 4. Cover pot with foil or lid and transfer to oven. Cook for 3 hours at 325 or until pork is tender and just about to fall off the bone. 5. One hour before the pork shanks are done, make the ragout. In a large stock pot, start by cooking your spicy lamb sausage on medium-high heat just until golden brown and then add onion, garlic, celery and carrot. Cook until onion is just translucent. 6. Add smoked paprika, chili flakes and dried oregano. Stir to incorporate. Add white wine to deglaze pot. Cook for about 10 minutes or until reduced by half. 7. Add canned chickpeas, including the liquid. Then slowly add half of chicken stock and bring to a boil, reduce to low heat and simmer for 25 minutes. 8. Add harissa paste and lower heat and let simmer for about 20 minutes, or until the liquid becomes rich and hearty, almost gravylike. Finish with fresh chopped parsley and the lemon juice. 9. On a large platter, spoon the ragout first and then add the shanks and top with sauce and lemon juice, removing the bay leaves. 10. Garnish with fresh sprigs of cilantro. Brewers continue to experiment with specialty ingredients, pushing the boundaries of flavor. 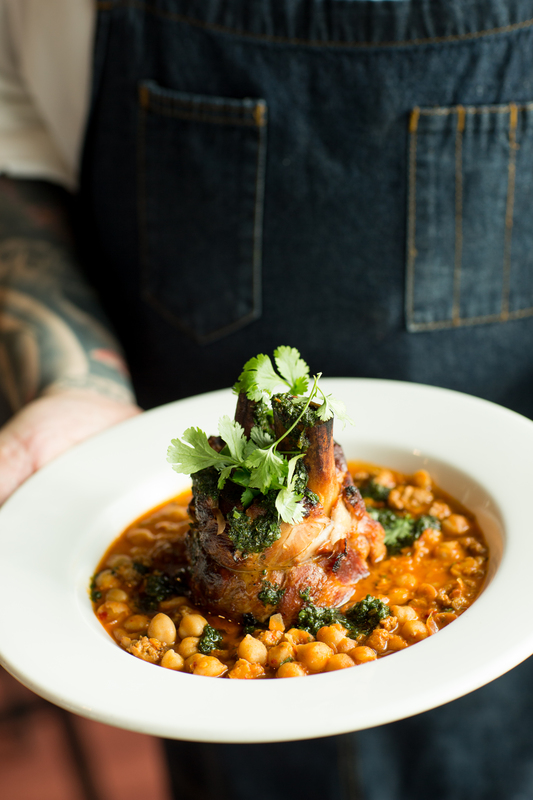 Since a good beer deserves a good meal, All About Beer Magazine asked Chef Luis E. Escorcia of Altabira City Tavern in Portland, Oregon, to taste a few beers infused with juniper and offer tasting notes and pairing suggestions. Get more pairing ideas and recipes at allaboutbeer.com/food. Tasting Notes: Rich with Belgian yeast characteristics and floral banana and clove, it’s refreshingly drinkable, especially as a winter pick-me-up. It starts off with lively aromas of fresh rye and spicy juniper and continues into a lively fruitiness with a toasted malt depth. Finishes sweet, definitely enjoyable. Tasting Notes: A lot of wonderful flavors emerge from this collaboration between the brewery and Wayne Wambles, the brewmaster of Cigar City Brewing. It smells like a juniper honey perfume. There are flavors of toasted spruce and coriander, and this finishes with a pop of grapefruit. It’s bold, so give your taste buds a few sips to adjust. You won’t be disappointed.